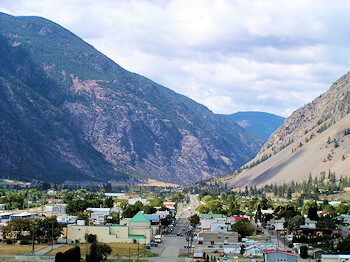 Keremeos, BC: Mountain desert community. Air so clean the world looks bolder and brighter. Clean water in the river and in the tap. Fruit trees in blossom. Lots of healthy food grown locally. Thats Keremeos. 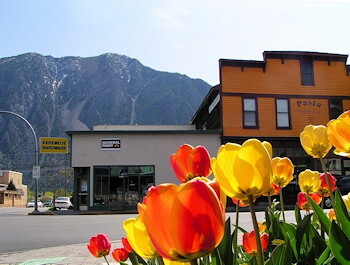 Keremeos, British Columbia, could be called the "Orchard Village." Nearly one-third of its area is occupied by orchards. Abundant sunshine and a vast, replenishing aquifer make the South Similkameen Valley one of Canada's most productive farmlands. 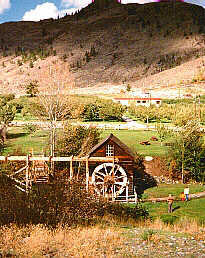 The South Similkameen is the Organic Farming Capital of Canada. At a dozen area fruit stands you can buy 200 kinds of peppers, every kind of tree fruit and ground crop. Our tomatoes are famous. We celebrate our agricultural heritage with two harvest season events, the Similkameen Sizzle and Taste of Our Valley. Summers are long and hot in Keremeos. The village gets its name from the Okanagan Nation's language and means "meeting of the winds." Residents are thankful for the strong breezes that blow on hot summer days. Winters are short and shoveling snow is not a frequent activity in Keremeos. Keremeos is a safe community. A place where a smile and a hello are exchanged when passing on the sidewalk. Residents are proud of the peaceful, clean, and healthy environment that they call home. Location: Located in the Okanagan Similkameen region of British Columbia, canada, 50 km west of Osoyoos and 50 km south of Penticton on Hwy 3. Stop and smell the tulips! For a little place, there sure are a lot places to eat. Several area restaurants offer fine dining in a relaxed atmosphere. Good family fare featuring locally grown products is easily found. Dont miss our German bakery, where German IS spoken. Three motels and a dozen on-farm B&Bs offer pleasurable places to stay. Camping and RV sites and cabins are plentiful. Take the Similkameen wine tour. 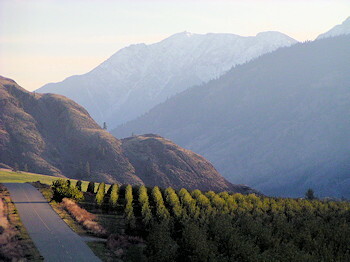 The Similkameen appellation has become recognized for its award winning hearty reds and complex whites. Each of our eight BC boutique wineries offer carefully crafted products and a memorable tasting experience. Two wineries produce organic fruit wines. One features a German style restaurant and a guest house; another combines its tasting room with an art gallery; all offer a pleasant place to sit and view the achingly beautiful (Canadian Geographic) Similkameen Valley. Fabulous Cathedral Provincial Park is only minutes from Keremeos. Apex Mountain Resort is a short drive away. Area trails through Canadas tiny true desert give opportunities to view one of the most species diverse regions in North America. Wild goats and sheep are common sights. Visitors may experience real farm life by staying at a farm B&B, taking a farm tour, picking fruit or meeting the critters face-to-face at Farmer Johns Petting Zoo. The 1860s Grist Mill is functional and the gardens and grounds take a visitor back to a quieter time. Accommodation & adventure providers in this area.